Its early Spring 2021. I am in the veggie garden of my new home, a blue and white Victorian that has been my dream home since childhood. Tom and I saved up for years to buy it, but the reality of it hasn’t sunk in yet. That this home is ours. I thought it would sink in when the Realtor handed us our keys, but it didn’t happen that way. I still had this unsettled feeling. That, like all our other homes, this one was temporary. I thought it might happen when we moved in our furniture, maybe when we unpacked the last box or finished painting the kitchen. But no, I didn’t realize it was mine until I planted my very first asparagus plant. Beep, Beep, Beep! I peel open an eyelid. Where am I? Beep, Beep, Beep! I sit up wiping the sleep from my eyes. The oven is screaming at me to take the Asparagus and Gruyère Tart out before it burns. I realize that I must have fallen asleep on the couch while I was waiting for it to cook. Last weeks flu took a lot out of everyone and we are still recovering. I hurry into the kitchen wondering how many times it had beeped and discover the tart is perfect. 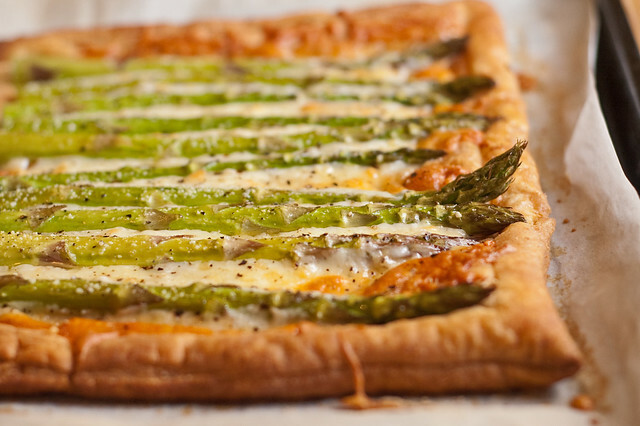 Crispy flaky crust, cheesy center and spears of tender asparagus lined up on top like little green soldiers. So simple, yet so satisfying on so many levels. I cut a slice for lunch and head out to my tiny city backyard to plan this Spring’s vegetable garden. I may not be planting asparagus yet, but there is plenty more to grow until then. 1. Preheat oven to 400 degrees F. On a floured parchment paper, roll out the puff pastry to about 16×10 inches. Trim any uneven edges and move the whole thing, parchment and all to a cookie sheet. With a sharp knife lightly score the dough about an inch from the edge all the way around (don’t cut through it, just leave an impression of a line). 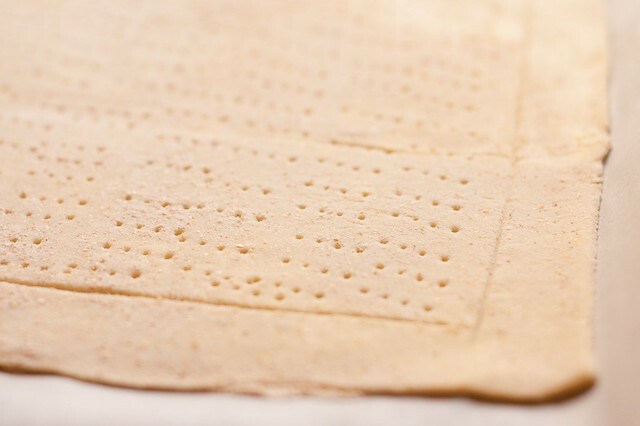 Use a fork and pierce the dough inside the marking at 1/2 inch intervals. Bake 15 minutes or until golden. Remove from oven. Its going to be a little puffy but don’t worry it will deflate itself over the next couple minutes. 2. Cut about 1 1/2 inches off the bottoms of the asparagus spears making sure they will fit inside the tart shell. 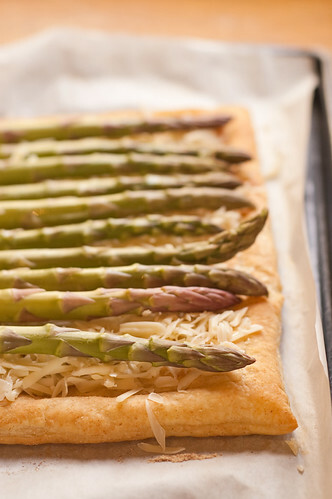 Sprinkle the cooked pastry with cheese and arrange the asparagus in a single layer on top. Brush with olive oil and season with salt & pepper. Bake 20-25 minutes or until cheese is completely melted, the asparagus is tender when pierced and the pastry is a rich golden brown. Remove and serve immediately. Beautifully written post and such gorgeous pictures! I fell in love with this the minute I found the photo on Foodgawker. Glad you woke up before it scorched itself to hell. Bookmarked! Your pictures are all gorgeous, but the top one really makes me wish that tart had just come out of my own oven! looks so delicious and easy to make. This can be a perfect appetizer for party ! Thanks for all the kind comments! I am so happy you are enjoying my stories and recipes! Simply delicious! I alternated my asparagus so each square had asparagus tips. So glad to see a review of someone that actually made the recipe. Now I’m ready to make it myself. Thank you. 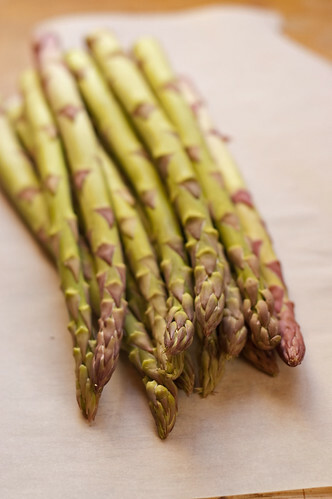 Asparagus is one of the delight of Spring, but having your freshly home grown must make it even more special. The tart look delicious ! I am so happy you enjoyed that recipe & photo. Its still one of my favorites. This is stunning–what a great party dish it would be. 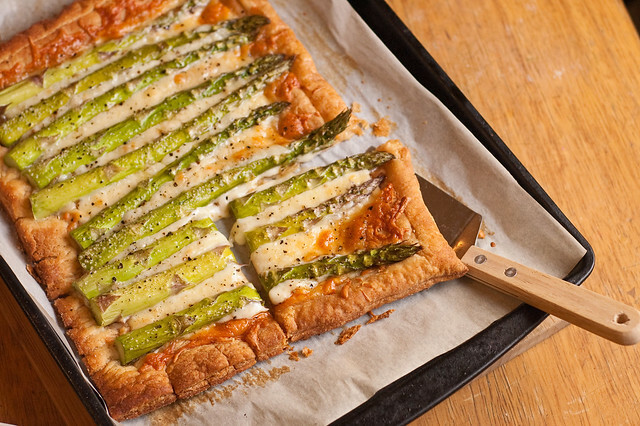 We adore asparagus and will have to try it this spring. Pingback: Deliciously Pinning: I Can't Stop Pinteresting Spring! omg this is GORGEOUS. So beautiful and I can almost smell it just looking at it. Love this and so glad I found your blog just now! It looks wonderful. I think the only thing I would change on it would be to alternate the direction of the asparagus. This way some people don’t get all bottoms or all tops. I just made this, and it was great. But next time I think I wouldn’t quite cook the puff pastry that long, it seemed a bit dry by the time the asparagus was fully good. But it flew off the plate and everyone loved it. (I did cut the asparagus into 2 pieces each which made it a better finger app).